The Riverfront opened in 2012 in a six-storey building directly across the street from the Indochine Market and Mekong River -- probably the best location of any hotel in Muk. Average rating 8.4 from 761 reviews. Though not as homely as the Riverview just up the road, it has spotless and modern rooms with a professional and secure atmosphere. Rooms come in a few styles, but you’ll need to spring for a superior if you want river views to compete with those offered at nearby Riverview Hotel for less cash. Accessed by a lift, the rather characterless rooms have shiny white tile floors, white walls and fluorescent lighting, but the beds are soft and all rooms are equipped with desks, TVs, air-con, hot water, fridges, free WiFi and hot-water kettles in case you want to take advantage of the complimentary in-room coffee and tea. Standards come with tiny balconies that have secondary sinks but no real views, while superiors boast the full-on river-facing terraces. A couple of free computers are available for guests in the lobby and a good complimentary breakfast buffet is taken in a sixth floor restaurant with sweeping views of the Mekong just after sunrise. 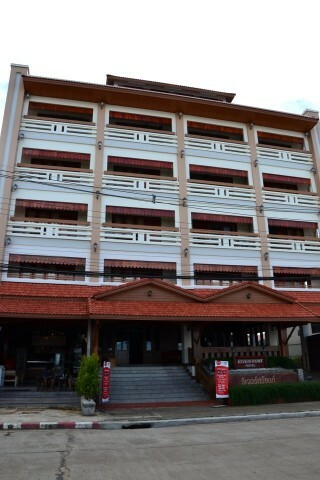 The staff speaks some English and the hotel has a covered car park. Several rooms with extra beds and suites with living rooms make this a good choice for families. If you have your own wheels, the Bird Day Boutique Hotel has similarly equipped rooms with more style out on Highway 212.